This article is designed to be a high-level overview of the differences between the Major versions of NovaBACKUP. The intended audience are those users that are unsure what they are missing out on from their current version. Added create an image directly into VHDX format, which means your image backups can now be directly used as a Hyper-V machine within minutes. With this feature, recovering from a disaster can be faster and easier. The Microsoft VHDX format supports > 2TB drives & UEFI. Added direct to Microsoft VHDX and VHD (Virtual Hard Disk) feature to scheduled and on-demand image backup. Improved backup speed. Actual performance increase varies depending on the hardware and configuration, but is expected to average roughly 10% when backing up to external devices such as USB or NAS drives. Single pass image recovery scans the last full image backup, then goes through each subsequent incremental image backup to acquire any later file revisions for a seamless System Image recovery process. Removed Support for Windows Vista. Removed Express Wizard from NovaBACKUP version 18.0 and newer. Removed Support for Windows Server 2003 and Windows XP. 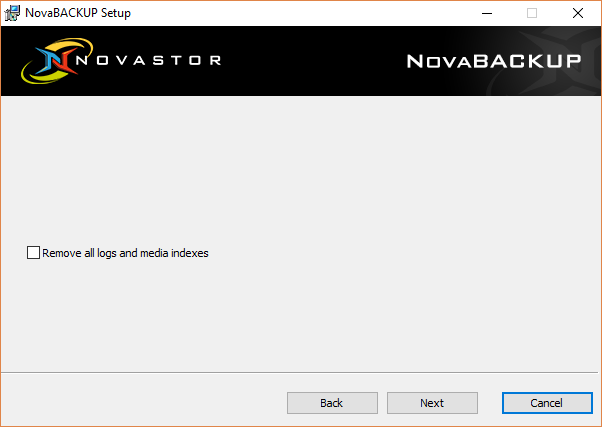 You will not be able to install NovaBACKUP on Windows Server 2003 or Windows XP OS with NovaBACKUP v17.6, and newer. The installer can recognize the previous 2 Major versions when attempting to update the software. If you currently have a version more than 2 Major versions you will need to uninstall that version to install the latest. If you have a version listed on this page you will likely be able to keep your existing backup settings, restore index, and logs if you clear the checkbox during uninstallation. If you have jobs created by the Express Wizard they will need to be recreated in versions 18.0 and newer.